5 magnetic models on illustrated metal board. Displays the basic structure of the human nervous system. 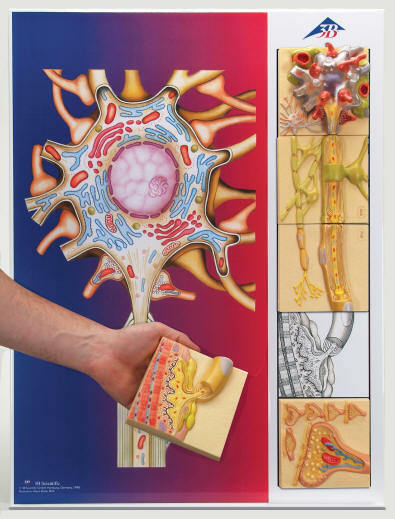 Each of the five sections shows a plastic, colored relief depicting the basic structure of the human nervous system. 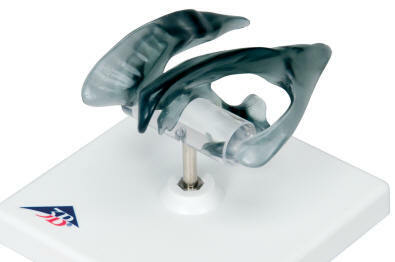 All sections can magnetically attach to the illustrated base which depicts the neural components in vivid colors. The five component reliefs are available individually. 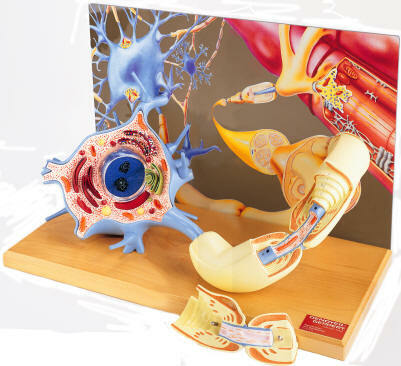 This relief model is half life-size and shows a schematic representation of the central and peripheral nervous system. An excellent model to study the structure of the human nervous system. Mounted on baseboard. The brain ventricles are life-size. This model comes with a stand. Magnified more than 2500 times and fully three dimensional, a neuron is depicted in its natural setting. With the membranous envelope cut away, the cytological ultrastructure, organelles and inclusions within the cell body are depicted in contrasting colors. A section of the axon lifts off to expose the enveloping myelin sheath and neurolemma, as well as the Schwann cell that formed them. Dendrites of the neuron extend into the background and synaptic vesicles carrying neurotransmitters can be seen via a cutaway view. 54 features are identified in the illustrated key. Mounted on a hardwood base. Overall dimensions: 17 x 18 x 11 inches.